A cooling system is needed to help the engine of your car maintain its operating temperature without overheating. This system uses coolant to help transfer the heat of the engine to the radiator where the heat of the coolant is removed and then re-circulated back into the engine via the water pump. Attached to the engine cooling system is the car's passenger's compartment heater which provides heat to the cabin occupants. Each component of the cooling system is connected using coolant hoses and heater hoses. While the engine is cold the cooling system thermostat is used to block the flow of coolant until the engine has warmed up to operating temperature. The cooling system is subject to engine vibration and heat. Over time this can cause the components, hoses, gaskets and seals to fatigue and fail causing cooling system leaks. 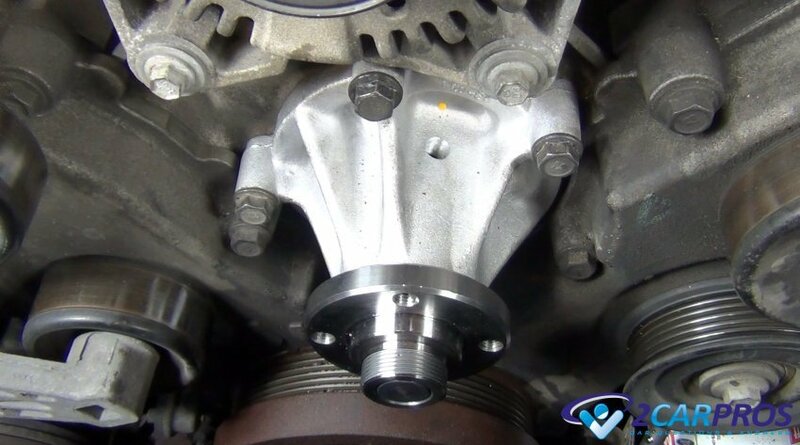 These leaks are a common automotive problem and can be prevented by checking over the system whenever a car service is being preformed. What Makes Up the Cooling System? Most cars (including hybrids) will have the following components included in their engine cooling system. 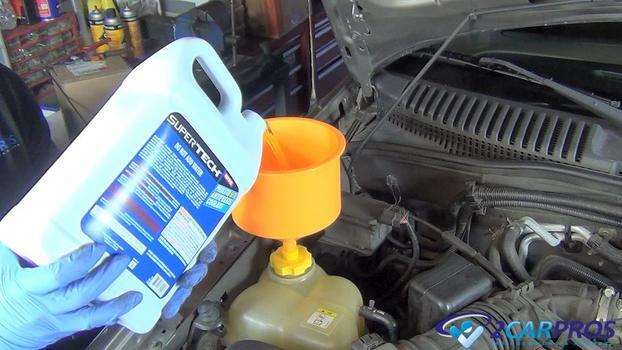 Coolant or antifreeze (same thing) is used to transfer heat from the engine to the radiator and should be added to and serviced by flushing the coolant on a regular basis to help prevent corrosion and avoiding engine overheating. 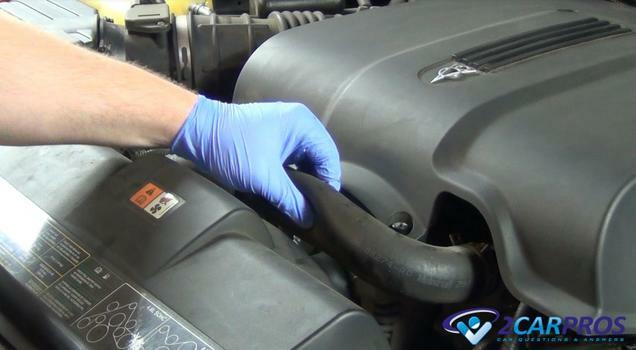 Coolant or radiator hoses are used to transfer coolant to each component and are held on by using hose clamps. These hoses are made individually for each car and each application and are double-walled nylon reinforced pre-molded units capable of withstanding the engine temperature and vibration. Upper and lower radiator hoses are larger is size then heater and bypass hoses and carry a larger volume of coolant. To check the conditioner of the hose wait until the engine has cooled and squeeze the hose. If the hose is brittle or really soft the radiator hoses should be replaced. A water or coolant pump is used to circulate the engine coolant throughout the system to help keep the engine cool while in operation. This pump can be driven by the engine's serpentine belt, timing belt, or timing chain. On hybrid cars and SUV's this pump can be driven by an electric motor inside of the pump itself. These pump's can fail due to age and leak or make a squeaking or grumbling sound in which case the water pump must be replaced. A radiator is used to remove heat from the engine coolant and transfer it to the outside atmosphere via the cooling fins of the radiator. When air is forced through these fins either with the assistance of the cooling fan or the vehicles forward motion it lowers the temperature of the coolant which is then transferred back into the engine. 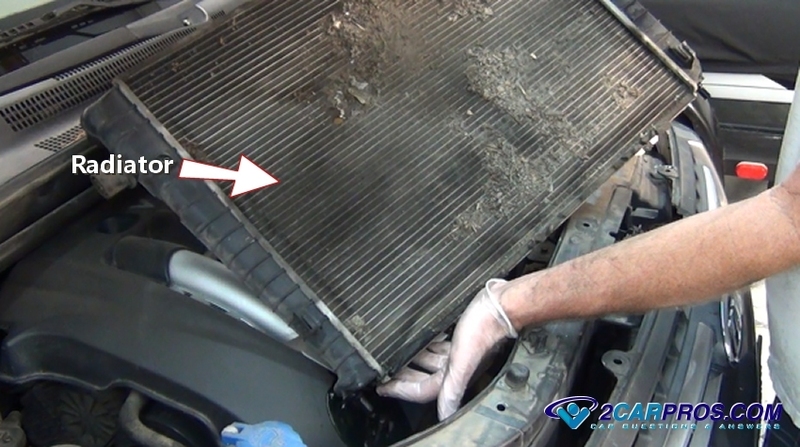 In the example below the radiator fins are blocked with dirt and debris which will cause the engine to run hot. If a leak appears in the upper or lower plastic tank or the aluminum core the radiator must be replaced. A radiator cap is designed to hold pressure on the cooling system which will increase the boiling point of the engine coolant. This spring loaded cap has an upper and lower seal and can be located on either the coolant reservoir or the radiator tank. 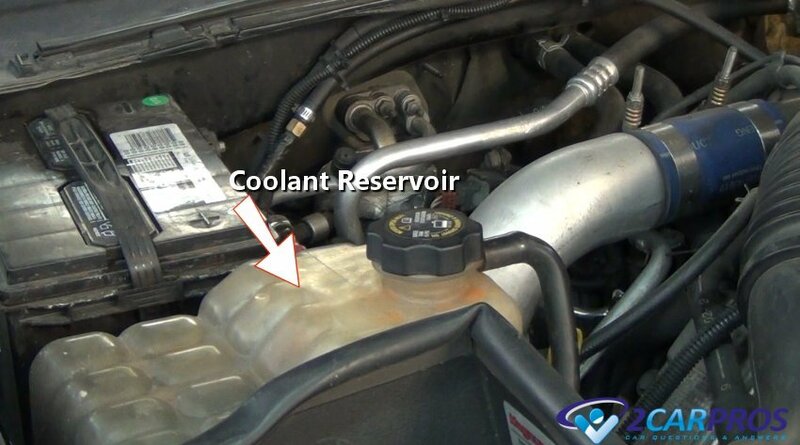 The coolant reservoir is used as a fluid expansion tank to hold extra coolant as well as the coolant that is pushed out of the cooling system once the engine heats up. 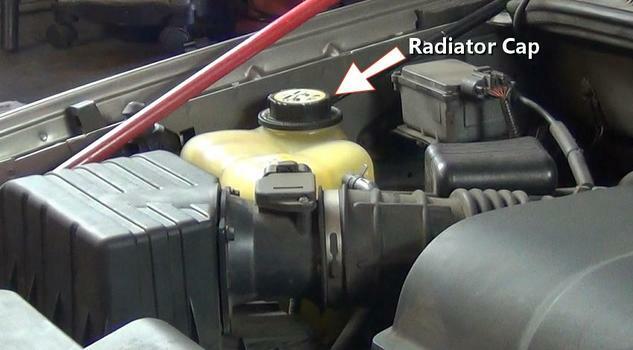 Once the engine has cooled down the extra fluid will be sucked back into the radiator to prevent any air bubble from entering the system. The engine thermostat is temperature sensitive device which is designed to open and allow the coolant to flow into the radiator when the engine is at operating temperature which is about 200°. 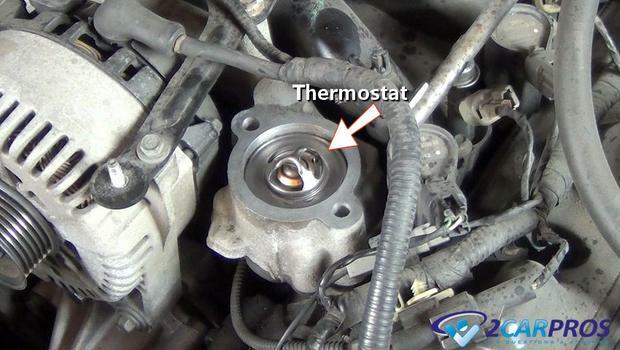 This device is located in the thermostat housing on the engine which can be either located at the upper or lower radiator hose connection on the engine. A common failure of the thermostat is to stick closed causing the engine to boil over within 15 minutes of driving. Also the thermostat can hang open causing the engine to run cold which will affect the computer and heater operation of the car. In either case the thermostat must be replaced. 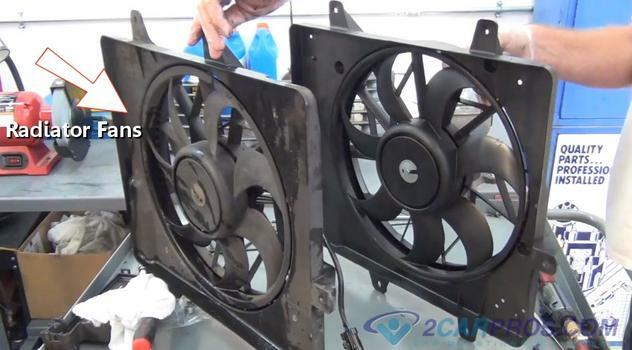 The radiator cooling fan can be either electronic or manually driven. An engine driven fan is called a clutch fan and can lock up causing a roaring sound when the engine is accelerated in which case the clutch fan should be replaced. These fans are located behind the radiator and pull air through the cooling fins to reduce the temperature of the engine coolant. The electric motor that drives the cooling fan in front wheel drive cars and some rear wheel drive cars can fail due to usage. If this failure occurs the radiator fan motor must be replaced to avoid engine damage. 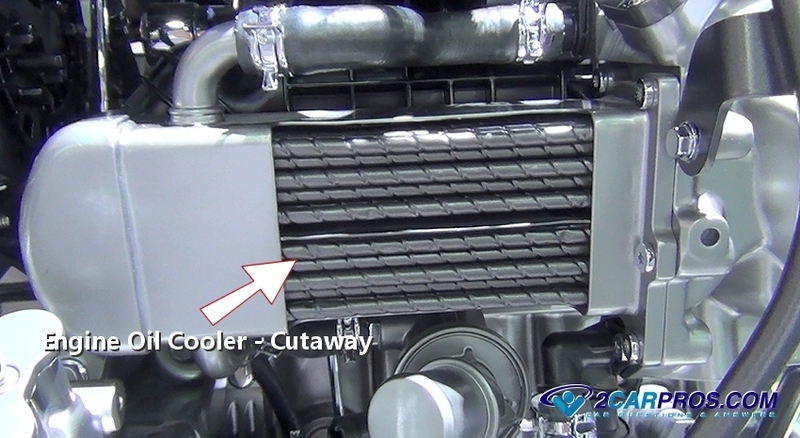 The heater core of the cooling system is design to provide heated air to the occupants of the car. The heater core provides a slight amount of cooling action which will assist the radiator and is located inside of the HVAC system which is used in the air conditioner and defrost modes as well. 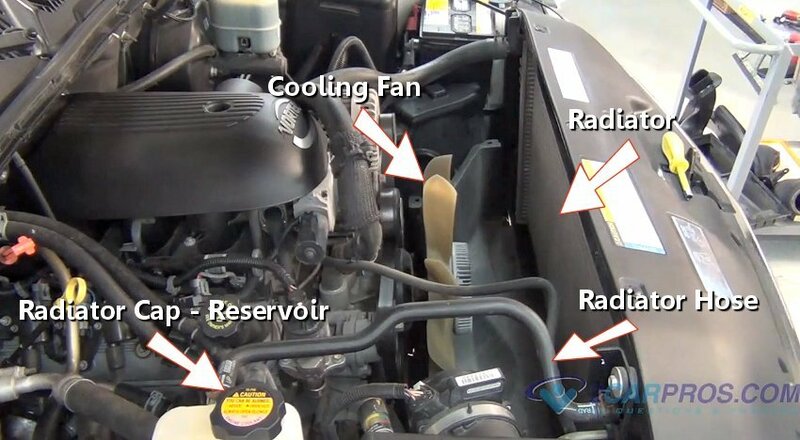 Connected to the cooling system using heater hoses when the heater core leaks it will allow engine coolant to enter the passenger compartment which can be detected on the passenger's side floorboard. An engine oil cooler is designed to reduce the heat of the engine by way of the engine oil. The engine oil is run through the cooler which is submerged in coolant. Not all cars have these coolers which will vary in size and location. Because of the design of this particular cooler when they fail it will allow oil to enter the cooling system as well as coolant to enter the engine oil. If you have any questions about the engine's cooling system, please visit our forum. If you need car repair advice, please ask our community of mechanics is happy to help you and it is always 100% free.